By Jake Rocheleau in WordPress. Updated on February 21, 2017 . We all know WordPress is a great platform: free, powerful, and comes with plenty of features right out of the box. However WordPress’ search feature could always be open for improvement. The Algolia dev team may have created the best WP autocomplete search plugin you can find. Search by Algolia is a plugin built for all modern versions of WordPress. 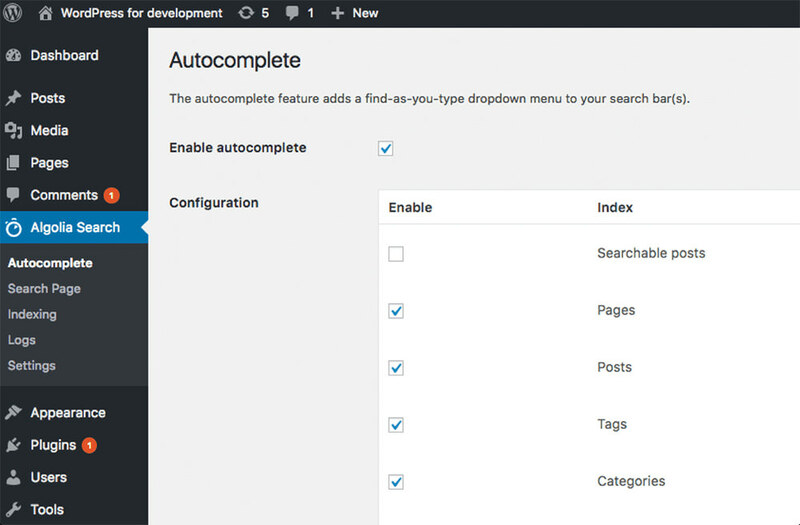 It automatically adds an autosuggest search bar into your site built on top of the default WordPress search. By default, the plugin is powered by the Algolia search algorithm which does offer a free plan limited to 10k searches per month. For most websites, this is way more than enough to get started. In fact, some blogs don’t even see 10k unique visitors per month, let alone having that many searches. With Algolia, you can test the waters to see if visitors stick around and use the new search interface more than the default. Customize settings in WP admin. You can adjust basic settings such as search features, asynchronous searches, results lists, and which pages should be indexed. You can also change how many autocomplete suggestions to have per dropdown and how much info to display to the user. Algolia really offers a lot of customization options with its search plugin. It’s naturally meant to be a free resource to help push their search service, but it’s still one of the quickest WordPress plugins with relevant autosuggestions. Note this plugin does require some technical setup, so it’s not a “set it and forget it” solution. You should have some comfort working in WordPress and knowing how to customize search features. But if you’re willing to give it a shot and go through the setup process you might be surprised at the final result. To learn more, check out the plugin homepage or visit the GitHub repo for the plugin source code. And of course, this plugin also has an official plugin page in the WordPress repo.